How can I manage units? In bexio you have the option of creating and managing different units. 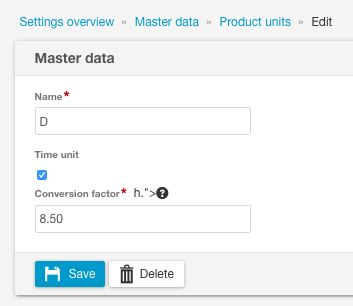 The overview of units can be found under "Settings - All settings - Master data - Product units". Use the "New unit" button to create a new unit. When creating units, you also have the option of marking these as units of time. Units of time also have a mandatory field entitled "Conversion factor". To find out what this factor is all about, please read the article "Conversion factor - what's that?". If you want to delete a unit, open the desired unit by clicking it, then press the "Delete" button. How can I manage product groups? What should be kept in mind when importing a product? How can I link my UBS e-banking account to bexio?